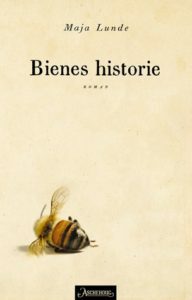 Knowing my love of reading and joy in discovering new Norwegian works, my parents gifted me Maja Lunde’s The History of Bees in Norwegian over a year ago. I wish I hadn’t waited so long to read it. It is such an interestingly structured and thought-provoking book about humans’ relationship to bees as well as relationships and expectations between family members. I really enjoyed it and highly recommend it, and luckily, now non-Norwegian readers in the US can enjoy it as well since it very recently came out in translation here. I’m always curious about how works in original language compare to their translated versions. Usually, I just read my Norwegian books in Norwegian, but this time I actually had the opportunity to read it in English as well. (The US publisher Touchstone kindly provided me with a digital advanced readers copy.) I was impressed by Diane Oatley’s translation. It was a very smooth reading experience in English. Nothing jumped out at me as being different from the Norwegian edition. In particular, I was impressed with how well she treated the different language usage by each of the main characters. Though I haven’t seen the American edition’s physical cover in person yet, I hear it’s gorgeous! It shimmers and is textured. I may just have to buy myself a physical copy of the American hardcover just for the cover. The novel is made up of three distinct storylines revolving around bees. It’s basically a look at the role of bees in the past, present, and future from the perspective of a family in each of those time periods, and the chapters alternate between these three narratives. The first storyline begins in England in 1852 when beehives are being perfected, the second one in the United States in 2007 when there is an increase in the number of colony collapse disorders being reported, and the last one in China in 2098 when humans have had to resort to hand-pollination due to the total collapse of bees. As the book progresses, the reader begins to see how the three families’ stories intersect. Once the book is finished, it’s interesting to look back and notice the common threads that weren’t obvious before. On top of it being a book about human’s relationship and reliance on bees, it is also about family relations and expectations. It looks at husband-and-wife relationships as well as relationships and expectations between parents and their children. It is not a smooth journey for any of them. The most heart-breaking family dynamic is that of William’s family in England. William puts all his time and energy into trying to prove his worth to his son. However, it is his daughter Charlotte who is interested and eager to learn from her father and help him with his work. Each of the narratives was very engaging, and it didn’t take long before I was totally absorbed in the book. My favorite narrative was that of Tao in China. It was a depressing and grim world she lived in, but her quest to find out what happened to her son when he suddenly got sick and was whisked away by authorities without any explanation was a definite page-turner. 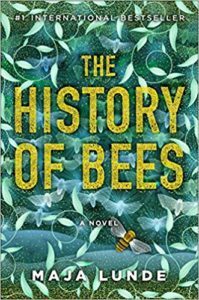 Through the different storylines, I not only learned about the history and practices of beekeeping, which I thoroughly enjoyed, but I also got a glimpse of a world suffering from a total bee collapse, which was unnerving. Luckily, there was a glimmer of hope at the end. My only complaint of the book was that in each of the three families, the hopes for the future were placed on a son. I understand that might have had to be the case for England in the 1850s, but it didn’t need to be that way in both the 2007 and 2098 narratives. Having the emphasis be on a daughter in one of those two later time periods would have been okay, I believe. Overall, this was a unique novel combining dystopian, contemporary, and historical fiction into a very engaging and thought-provoking piece, which will stay with me for a long time. The next novel in the series, Blue, comes out this fall in Norway. I’m eagerly awaiting its publication. This entry was posted in Books & Reading and tagged #booksintranslation, #womenintranslation, Bokhandlerprisen, Maja Lunde, Norwegian Lit by Patricia Zanuck. Bookmark the permalink. Høres ut som et juleønske. Tusen Takk! Jeg skal etterhvert lese begge utgavene. Jeg håper du liker bøkene like godt som jeg gjorde. Happy reading!